A great way to travel around Annapolis, Highland Beach, and Hillsmere Shores is in a subcompact SUV with poised handling, a comfortable ride, and plenty of features. If you enjoy these things plus a spirited drive, then you might like the Countryman. But to help you decide, you’ll first need to learn more about the vehicle. That’s why our team at MINI of Annapolis created this 2018 MINI Cooper Countryman review. Discover the characteristics of this vehicle and contact us if you have any questions. With just one look inside the Cooper Countryman, you’ll notice its sophisticated design. It has top-shelf surface finishes like British Oak. Plus, it has finely crafted upholstery options like Chesterfield Leather. A dual-pane panoramic sunroof comes standard. It extends to the back seat, so everyone on board can take in the fresh air and natural sunlight. There’s plenty of room for five passengers, with 40.4 inches of front legroom and 37.6 inches of rear legroom. There’s also more than enough room to fit your personal items inside. The Countryman offers 17.6 cubic feet of space behind the rear seats. Fold the 40/20/40 split rear seats down and that space expands to 47.6 cubic feet. Plus, the vehicle has an optional picnic cushion. This plush seat folds easily into the open trunk, making it easy to have an impromptu tailgating party. The 2018 Cooper Countryman has lots of high-tech features to make your rides more enjoyable. 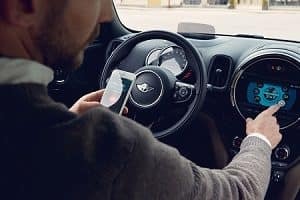 It comes standard with MINI Connected, an infotainment system with a 6.5-inch high-resolution display screen and Bluetooth® capability to stream audio or make hands-free phone calls. Upgrade to a higher trim level and you get MINI Connected 5.0. The display screen expands to 8.8 inches, and you get a navigation system with real-time traffic updates. Another standard tech feature is a rearview camera. It lets you maneuver tight spots with ease thanks to highlighted guidelines that’ll display your current path. Furthermore, you won’t need to think about bringing along a charging cable for your phone. That’s because the Countryman offers wireless charging for your mobile device. This way, you can take long trips without worrying about your phone battery dying. Plus, each engine is paired with one of three transmissions: a 6-speed manual, an 8-speed sport automatic, or an 8-speed with shifter paddles. Additionally, there are three driving modes to tailor your driving experience. Sport mode will tighten the steering and adjust the throttle for a more aggressive and thrilling drive. Green mode is for a more fuel-efficient performance. It has optimized fuel delivery as well as coasting feature that disengages the automatic transmission when your foot is off the gas. Mid mode will give you the perfect blend of performance and efficiency. As you can see, the MINI Cooper Countryman has the performance and features to take on any adventure around Annapolis, Highland Beach, and Hillsmere Shores. 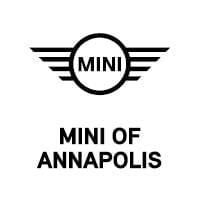 If you want to experience this vehicle for yourself, then schedule a test drive at MINI of Annapolis today!